Our apartment house is located within walking distance from the historical center. Zizkov is a very popular residental district full of 3-4 star hotels and guest houses. By tram no. 9 it is only 3 stops from the Wenceslas square, by the tram no. 5 only 3 stops from the Old town square. Close by you can find lots of typical Czech pubs, stylish restaurants and nice cafes. You can relax in the Riegrovy sady park with a big beer garden or take your children to its nice playground. Parking in our secured garage for 240 CZK/night. Fully furnished rooms or apartments available for very special prices. This kind of accommodation is perfect for the leisure travellers who are looking for an economic but comfortable accommodation. 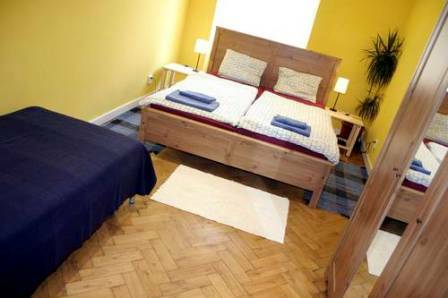 ROOM - DOUBLE You will be accommodated in 1 of these options: * Room with a double bed, sofa, Sat TV, bedside tables, cupboard. 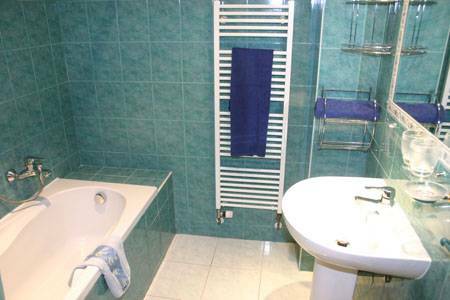 Shared Bathroom )with Bath or shower) with another room. INTERNET USE FREE OF CHARGE in our office - in the same building! * Fully equipped kitchen with a double bed or 2 single beds, washing machine, fridge, oven, cooker, waterkettel, iron + ironing board. Shared bathroom with another room. INTERNET CONNECTION FREE OF CHARGE!!! ROOM - TRIPLE + QUADRAPLE Room for 2-4 persons. All rooms are furnished with 1 double bed + 2 single beds or one king size sofa bed, wardrobes, bedside tables, coffee tables, sofa, SAT TV. Modern bathroom with bath or shower shared with another 1 or 2 rooms. FREE HIGH - SPEED INTERNET AVAILABLE IN OUR OFFICE WHICH IS IN THE SAME BUILDING!!! APARTMENT - 2- 6 BEDS Nice apartments with capacity 1-6 persons. 1 separate bedroom with a double bed and either a sofa for 2 or 2 single beds, separate fully equipped kitchen with washing machine, dishwasher, fridge and freezer, stove, oven, microwave, iron + ironing board. another 2 single beds or 1 sofa. Private bathroom with shower or bath. INTERNET CONNECTION free of charge! You can start your day with our rich BREAKFAST FOR ONLY FOR 120,- CZK / PER PERSON !! The breakfast will be served in the restaurant Sklep, 100 metres from the building. For reservation, please, contact our office! FREE HIGH-SPEED INTERNET ACCESS IN EVERY APARTMENT - YOU CAN BRING YOUR FREE PC AVAILABLE IN OUR OFFICE WHICH IS IN THE SAME BUILDING!!! Our apartment house is located within walking distance from the historical center. 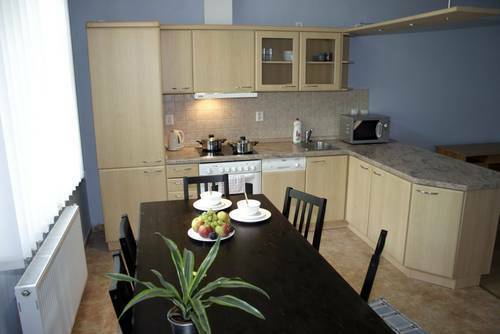 Zizkov is a very popular residental district full of 3-4 star hotels and guest houses. By tram no. 9 it is only 3 stops from the Wenceslas square, by the tram no. 5 only 3 stops from the Old town square. Close by you can find lots of typical Czech pubs, stylish restaurants and nice cafes. You can relax in the Riegrovy sady park with a big beer garden or take your children to its nice playground. Parking FREE of charge on the street or in our secured garage for 250 CZK/night. 1ST NIGHT GUARANTEE To make your fix reservation we have only one simple requirement which is a GUARANTEE OF THE 1ST NIGHT BY CREDIT CARD - to arrange your fix reservation we will only authorise the 1st night amount and confirm your fix reservation within 24 hours, (except the Top seasons when we authorise the whole payment). By this way you can pay upon your arrival in CZK, in EUR or by Credit card. We will charge the 1st night amount only in case of cancellation. Please check our cancellation policy.
! ! ! Astra accommodation reserves the right to change accommodation in some kind of emergency to a different apartment of the same quality for the same prices ! ! ! Cancellation less than 5 days prior to arrival - 1st night payment. We reserve the right to change accommodation in case of some kind of emergency to a same level apartment for the same prices. PLEASE NOTE that you are accommodated in private apartment so please after 22:00 DO NOT DISTURB your neighbours as they would be in the right to call the police. We also reserve the right to quit your accommodation in case you do not observe the silent hours and violate regulations in our accommodation facilities. We reserve the right that in case that the clients make a double booking and they not stay in our apartment we charge the whole payment for their stay. 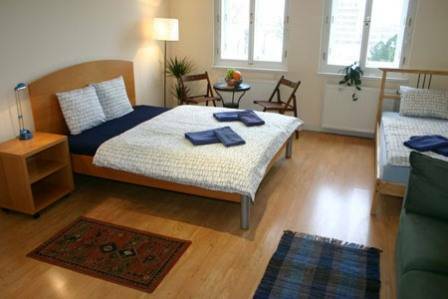 Apartments and rooms are situated in Prague 3 - Zizkov - 15 minutes walk or 3 stops with tram from the city center (with tram nr 5, 9, 26 + night trams nr 55 , 58). Only 1 stops with tram (10 minutes walk) from the main railway station (Hlavní nádra�í). 1) From the AIRPORT take a bus nr 119 and go to DEJVICKA STATION. There change for tram no 26 and go apx 20 minutes to the stop HUSINECKA. As you get off the tram, walk up the street and turn the first street to the right. On the left side you will already see our Astra Accommodation sign. 2) From the main railway station (HLAVNÍ NÁDRA�Í) take any tram (5, 9 or 26) and go 1 stop (to the right) - to HUSINECKA stop. As you get off the tram, walk up the street and turn the first street to the right. On the left side you will already see our Astra Accommodation sign. 3) From the HOLE�OVICE train station take a metro (red line) and go to HLAVNI NADRAZI stop. There walk out of the station and go left till you reach trams. Then take any tram (5, 9 or 26) and go 1 stop (to the right) to the stop HUSINECKA. As you get off the tram, walk up the street and turn the first street to the right. On the left side you will already see our Astra Accommodation sign. from motorway D 1 - follow the city centrum, after the Muzeum on your left follow the sign ZIZKOV - from the Wilsonova street turn right to Seifertova street. Go up and in Vita Nejedleho turn right, then again the first street right to Vlkova and then the secon street right to Krasova. On your right you will see our Astra Accommodation sign. from motorway D 5 - follow the city centrum, cross the bridge called Jiraskuv most, drive on the Resslova than straight away on the Jecna street to the I. P. Pavlova square, here turn to the left to the Legerova street and drive. On your left you will pass national Muzeum, then the main railway station. Turn right to Seifertova street (directions to ZIZKOV) Go up and in Vita Nejedleho turn right, then again the first street right to Vlkova and then the second street right to Krasova. On your right you will see our Astra Accommodation sign.